This month's snowflake was fretting about the 'terror' of the six minute wait while Schiaparelli– the 'Entry, Descent and Landing Demonstrator Module' (EDM) – of the European Space Agency's ExoMars project was hurtling towards the Martian surface. His fingers would be crossed, he told us. He'll need a better superstition. Schiaparelli seemingly did not survive those six minutes. Another Beagle 2 it seems. The confidence in the success of the mission at ESA was not high, despite all those crossed fingers: the lander was carrying no instruments worth the name and had no solar panels, relying instead on batteries that would only last a few days. Schiaparelli was a 600 kg (dis)proof of a landing concept. The clue is in the module's name: the 'Entry, Descent and Landing Demonstrator Module'. Here on Earth that concept would be called 'fly-tipping': depositing junk in inaccessible locations. Better not ask what it cost. It really doesn't look good for the ESA, what with the loss of Beagle 2 and now Schiaparelli (made in Italy). We should also note that the Rosetta mission got spectacularly close to a comet, but the lander concept also failed. In the same period in which the cultured Europeans have been crossing their fingers and decorating the surface of Mars and an innocent comet with failed technojunk, those illiterate, monolingual, culturally defective, Trump-voting, lardbutt Amis at NASA put the rovers Spirit, Opportunity and Curiosity on the surface, as well as the static lander Phoenix. All these modules not only landed safely but carried out their missions far beyond their planned lifetimes. 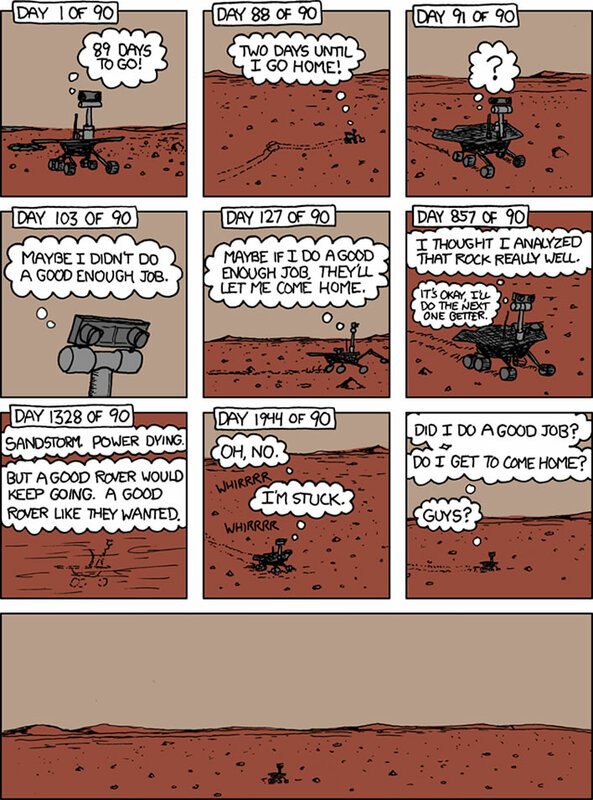 The last three are still operational, which fact being a good opportunity to add Randall Munroe's clever and deservedly famous cartoon about Spirit, the first rover (we on this blog are even prepared to praise deluded CAGW alarmists when they get something right, as Munroe often does). ESA press release 'It’s what we want from a test' – err, that it goes wrong. Always look on the bright side. “In terms of the Schiaparelli test module, we have data coming back that allow us to fully understand the steps that did occur, and why the soft landing did not occur,” David Parker, ESA’s Director of Human Spaceflight and Robotic Exploration. The attempt of the fans of the failed Beagle 2 Mars lander to demonstrate that it oh so very nearly worked and was therefore not, like, a TOTAL failure continue. 'Failed Beagle 2 lander DID open up on Mars: The lost probe deployed at least three solar panels before cutting out', we are told. 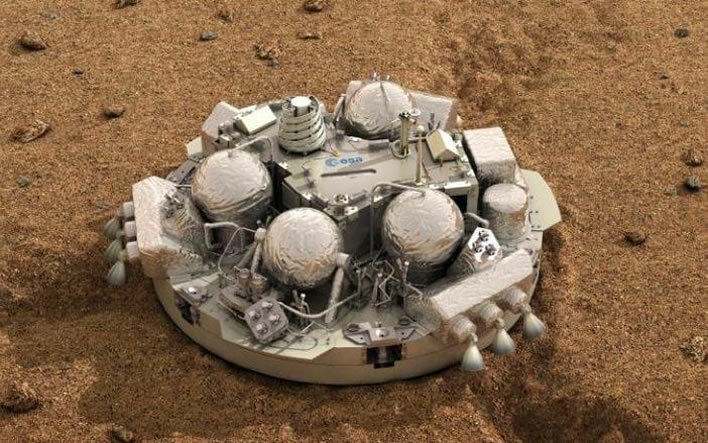 A reconstruction of the Beagle 2 lander, showing us how it looked fresh from the shed where it was constructed and before its heroic flight to oblivion on the Red Planet. Unfortunately, the brilliant design folded the solar panels over the radio aerial. If one failed to deploy then no communication would be possible and the entire mission would fail. Which is what happened, it now seems. European designed landers always seem to have no built-in redundancy. 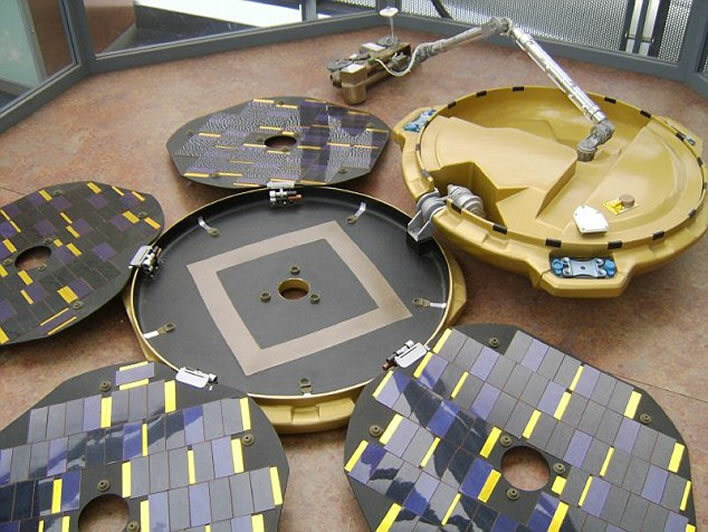 On Beagle 2, if one panel out of four fails to deploy, the mission is a complete failure. On the Philae lander of the Rosetta mission, the failure of the harpoon that was supposed to attach the lander to the comet meant the complete failure of the lander. On the Schiaparelli lander, so we are now told, a 'communications problem' between the computer and the altimeter caused the lander to crash: 'everything worked' – the heat shield, the parachute, the retro-rockets – just not at the right time. All the complicated and expensive technology on each these devices is held together by a chain of hopes, optimism and, ultimately, 'crossed fingers'. The researchers believe that one of the panels failing to open properly could have been enough to interfere with the radio antenna being able to send back a signal. Beagle 2 on Mars (presumably). Top: Photographs from NASA at various sun angles. Middle: left, the photo; right, the 'improved' photo. Bottom: Just in case we thicko non-scientists cannot understand the improved photo, here is an even more improved graphic from De Montfort University. Clear, now? 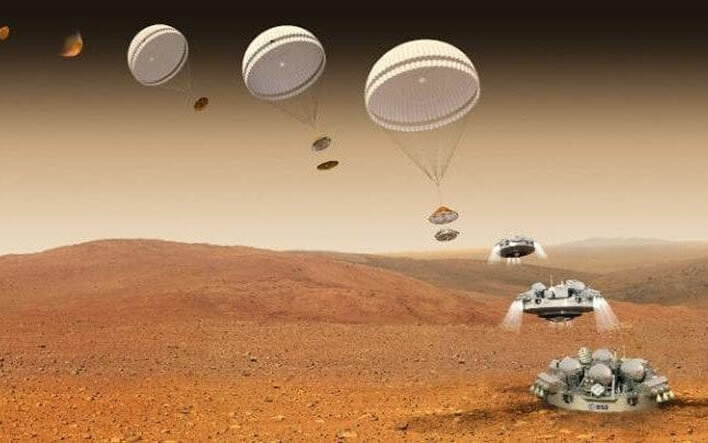 The patriotic strings of the money lyre are plucked so that we can 'further define the configuration' of the first 'UK ESA lander to land on Mars'. Well, land it did, but not in any useful way. Do we really need to spend a pile of money to find out the precise manner of its uselessness? That the Beagle 2 team is still flag-waving the concept of a 'UK ESA lander' is actually quite depressing: it seems the ghost of Colin Pillinger (hubris-nemesis) is still floating around somewhere in Leicester. 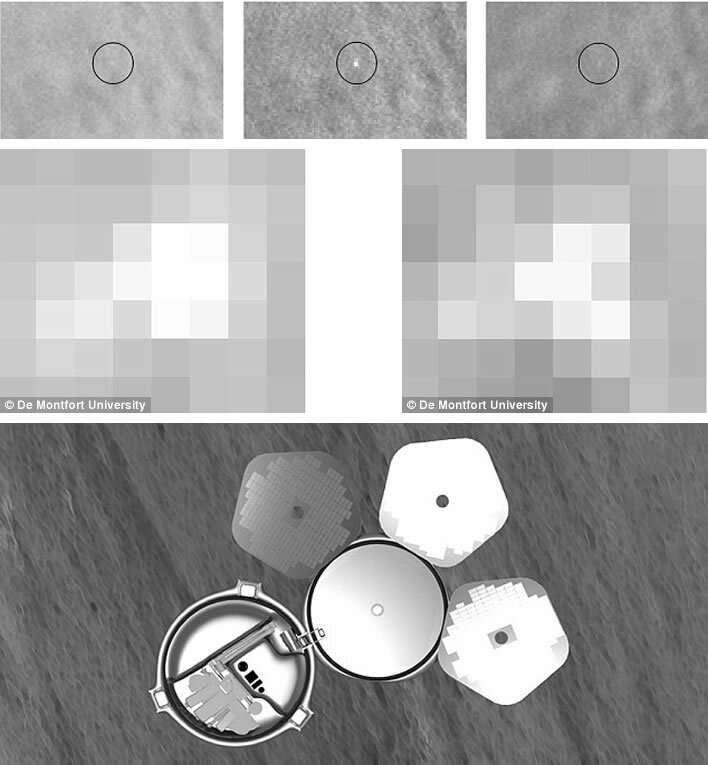 We might have a little more respect for this outfit – not much, though – if they had only credited properly the people who took the pictures of poor little Beagle 2's grave: NASA. You know, those Trump-loving American idiots who already put three self-propelled landers on Mars. Pleased to hear of the successful landing of the InSight lander on Mars. So far everything seems to be working as planned. For us the news represents the latest instalment of the nemesis that has followed the hubris of the dismal failures of the previous UK/European attempts to land a probe on Mars: Beagle-2 and Schiaparelli.